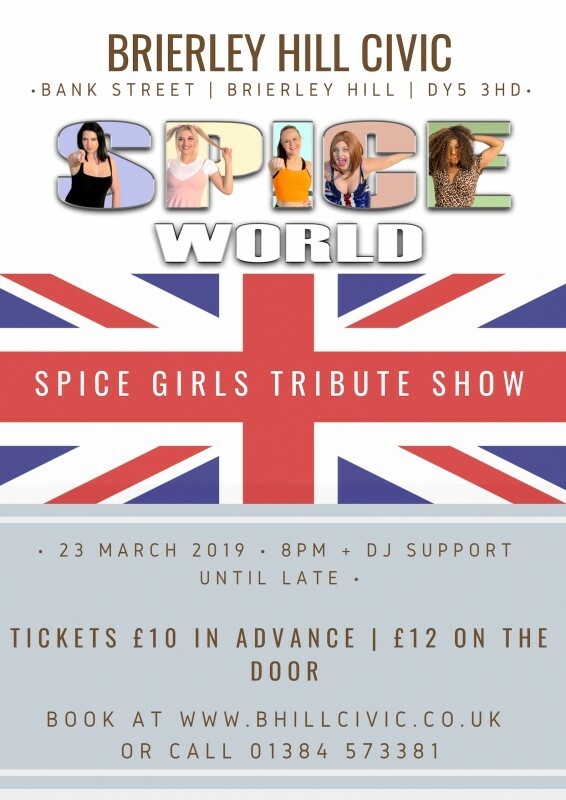 On March 23rd we welcome Spice World to the Civic. Five professional singers with bubbly personalities and bags of energy and enthusiasm from The West Midlands bringing the 90s pop music to you to celebrate the return of THE SPICE GIRLS! After the success of the Girl Power! Sp!ceworld and Return Of The Spice Girls, we have analysed and handpicked the best “Highlights” of all the live shows and tours and packed them into a high energy, fun and unbeatable show! With high energy dance routines and audience participation the show ensures an accurate portrayal and has the true impersonations of the sounds, look and feel of the Spice Girls!. Featuring all the favourite’s including Wannabe’, Who Do You Think You Are’, ‘Say You'll Be There, ‘Spice Up Your Life’, Stop’, ‘2 Become 1′, Goodbye’ and many more. The show is bound to keep YOU the audience on the dance floor with hit after hit from the bands astonishing albums and tours! So Spice Up Your Life and book the ‘Must See’ act of the year and let us take you on the journey of the Spice Girls. After the girls have finished our DJ will keep the party going until late!